Getting a good night’s sleep is imperative to proper mental and physical well being. Despite the fact that we know this, all too many people neglect the very problem that is affecting their sleep; their pillow. This is especially true of those who sleep on their stomach. Some do not realize that a different type of pillow is needed than for those who typically sleep on their sides. Rather than having a pillow that can support their shoulders, stomach sleepers need a pillow that is thinner. This pillow should not pull the head backwards, as this usually causes neck pain. Also, when compiling a list of great pillows for stomach sleepers, we looked for ones that kept the head cool. While there are various forms of pillows suitable for stomach sleepers, we did not focus on those that had an esoteric quality, as there can be hundreds of odd shapes and sizes. We are simply covering the most popular ones found for 2019 that can easily be purchased on Amazon. And without further ado, here is our list, in no particular order. Duck down is considered to be high quality down. By purchasing a down pillow, you are getting the biggest bang for your buck. Down is generally much longer lasting than products with synthetic materials. But one must also weigh out the pros and cons of using down pillows over synthetic pillows. Either way, for those who are interested in down pillows, we have found the perfect match for the stomach sleeper. The Downlite Extra Soft down pillow lays flatter than regular pillows. This is ideal for back and stomach sleepers alike. Also, even though it is extra soft, it does not compress as much as other soft pillows. You can also bunch this pillow into a ball for switching to a side sleeping position. While the Bluewave memory foam pillow is made of synthetic materials, this can be an advantage. Memory foam will conform to the contours of your head, thus making you feel like you are well supported. Unlike most memory foam pillow products, this one is made to be especially flat, and just the right fit for stomach and back sleepers. Those who have a very small frame can also benefit if they are side sleepers due to the low profile of the pillow. The following are just some of the awesome features of the Bluewave. Shredded memory foam is different from regular memory foam in the sense that it allows for more airflow. It also helps to prevent clumping and compactness. While there is nothing wrong with regular foam, if you want to feel it in a different sort way, the Eden shredded memory foam pillow may be your answer. It has a unique, gusseted design that keeps the support intact no matter where your head lays on the pillow. Like the Bluewave pillow mentioned above, the Eden provides plenty of cooling because the memory foam is infused with a cooling gel. Comes with a 100-night guarantee. If you don’t enjoy the pillow as much as you thought you would, simply return it for a refund. After the 100-day trial, there is a 5-year warranty in place. There are so many pillows to choose from when it comes to pillows. 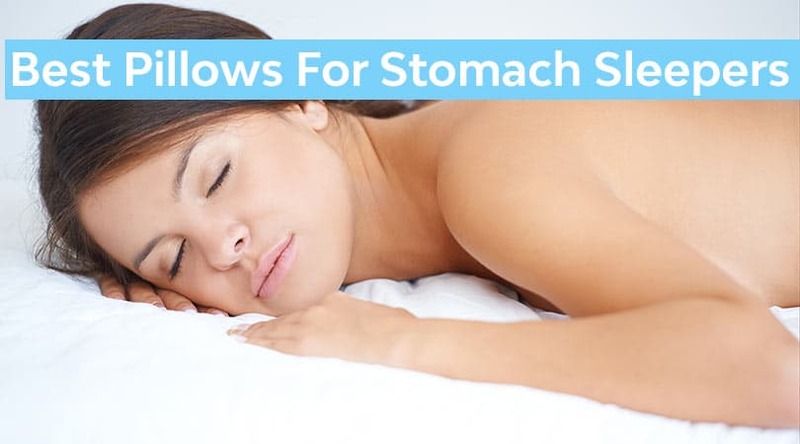 When narrowing it down to stomach sleepers, it can be a bit easier to make a decision as to which pillow to purchase. Whichever pillow you choose, please be sure that it is made for your particular sleeping patterns. And remember that stomach sleepers can sometimes also be side sleepers, so you must account for your various sleeping positions. The above pillows should reflect most of you pillow needs. However, if you have any questions or would like some further advice on pillows, please leave a comment below.